O’FALLON, Mo. – River City rookie infielder Matt Reida has officially had his contract purchased by the Tampa Bay Rays organization. 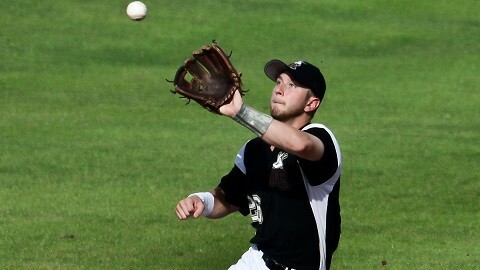 After spending two games in the Frontier League, the infielder will move into affiliated ball. Reida is a 2010 graduate of Western High School and will join the organization in the Gulf Coast League in a rookie league. Reida finished his collegiate career at the University of Kentucky following a second place regional finish to Louisville. Previously a 47th round selection of the Chicago White Sox, he started most of the Wildcats’ games during his four years at UK. In his senior season at Kentucky, he batted .246 with 10 doubles, four homers and 36 RBI. Reida joins Dane Stone, signed by the White Sox last week, as 2014 Rascals to be signed by Major League organizations. Reida is the fifth current Howard County native on a professional baseball roster. He joins Arizona Diamondbacks relief pitcher Joe Thatcher (Kokomo), injured Atlanta Braves starting pitcher Brandon Beachy (Northwestern), Stockton Ports (Oakland A’s Single A affiliate) relief pitcher Nolan Sanburn (Kokomo) and recent San Diego Padres draft pick T.J. Weir (Kokomo) on pro rosters. Reida, Sanburn and Weir are all members of an outstanding Howard County graduating class of 2010, with all three playing NCAA Division I baseball. Sanburn was a two-year closer for Arkansas and appeared in the 2012 College World Series before being drafted by Oakland and Weir just finished a standout career at Ball State.